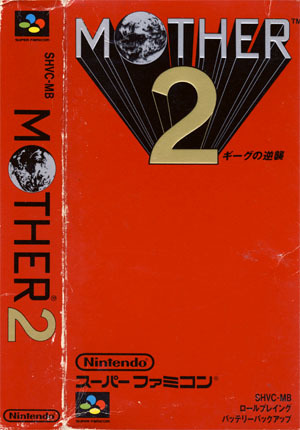 Mother 2, aka Earthbound, is a role playing game by Nintendo and sequel of Mother originally released in Japan for the Famicom system. In the years 199X, a weird meteor crashes in the hills behind Ness's Home in the middle of the night. The young boy, always eager for adventure, sneaks out that night and goes off to investigate the situation. Later on, helped by his neighbor Pokey, he meets Buzz-Buzz on the crash site - this talking bee from the future reveals him that the evil Gīgu (aka Giygas) is planning to take over the world. A prophecy predicted that three boys and a girls will stop Gīgu's terrific plans and he knows that Ness, with his psychic powers (called PSI in the game), is one of them... The boy and his friends embark on a journey to save the world and find the eight sanctuaries to reunite the power of the Earth and defeat Gīgu. The game follows the same rules laid down by other role playing games of the time - it is however an unique mix of titles such as Final Fantasy and Zelda. The world map is always at the same scale and enemies freely wonder around it - no random battles. However, fights are turn-based and follow a more traditional approach with a brilliant twist - the game automatically skips fights against weak enemies (they may even run away from the player !). Characters have their own set of skills, special abilities and they all complete one another. Ness is the strongest and defends himself with a baseball bat, Jeff is the geek of the group and can repair anything, Paula has super-psy abilities and Poo seems to be good at anything, thanks to his Mu training. Interestingly, the game's progress can be saved by calling Ness's dad on the phone. The first Mother (picture on the left) was released for the Famicom system in 1989. The game features a young boy traveling the world and fighting a race of mind-controlling aliens. It was created by the Japanese writer and essayist Shigesato Itoi. Mother was sadly never released outside of Japan - an American version was initially planned but never made it to the shelves. 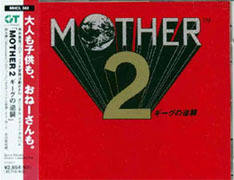 A copy of the game was however released to the public in 1998 and called Earthbound Zero. 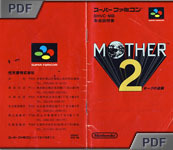 Mother 2 was then released in Japan in 1994. 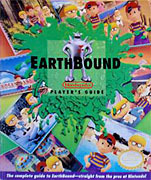 The American version was released a year later and went by the name EarthBound. 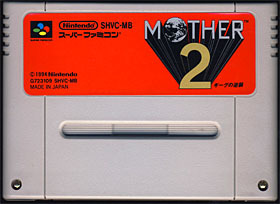 In 2003, Nintendo released in Japan Mother 1+2 which combined the first two games packed into one cartridge for the Game Boy Advance. The game was probably to promote the third opus, called Mother 3, released in 2006 for the Game Boy Advance. Both cartridges are currently only available in Japan. The voice that says "Ok desu ka" ("Ok isn't it ?") when the players enters his name is supposed to be Shigesato Itoi, creator of the game. GIYGAS INVASION!!! BIZARRE ALIENS ROAM THE EARTH!!! Intergalactic terror strikes the small town of Onett as a blazing extraterrestrial object crashes in the night! The earth now faces imminent destruction by the universal evil threat known as Giygas! Armed with a cracked baseball bat, a cookie and an ATM card, a courageous boy named Ness vows to save the planet from hideous destruction. He must first find his heroic companions, Paula, Jeff and Poo. Will Ness succeed in his attempts to ambush countless frightening monsters as he travels ? The ultimate test lies in the impending encounter with the all powerful Giygas! !